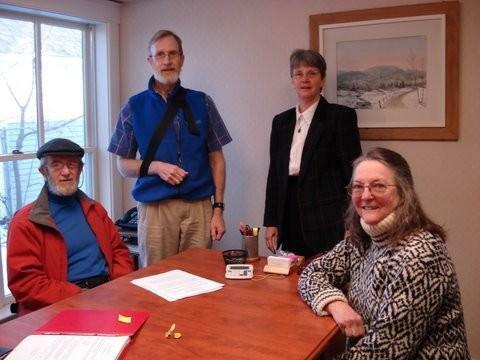 Seated are Ron and Shirley Davis who signed an Easement on their Gardner Road property to the Orono Land Trust. Standing are David Clement, and Gail White, of the OLT Board. A conservation easement is a useful tool for landowners who wish to protect their land from future development, while retaining ownership of the property. The landowner may also receive several economic benefits from donating a conservation easement. Easements offer permanent protection from development, and can be written to conform to the specific desires of the landowner. For example, an easement on a forested piece of land might prohibit future construction or subdivision, while retaining the owner’s rights to hunting, timber harvesting, and recreation. The conservation easement is generally donated to a land trust or other non-profit agency, which will ensure that the conditions of the easement are met in the future.